Air & Worms and Tailgate. We haven' had a Tailgate party yet but from now on it's possible. Suitable for Sushi perhaps? Nevertheless, since we're moving forward with the front of the car and since Anders has got control over the air piping worms nest, it's time to get going with the rear end of the vehicle and start to populate the trunk area with all kinds of useful stuff, like fuel tank, pumps, filters etc. But first, find the tail gate, the hinges, the screws. Took some time... then make it fit. Lower part was no problem. The upper part needed a little bit more adjustment...will we use the original roof hinges? There are pro's and con's. A debate and a modification will be needed. Thick Worms crawling around the engine. But it looks like we're reasonably well prepared for the assumed airflow of 3000kg per hour. Yes, we'll have to make some hoodlouvers as well. The Amazon hood is however not perfectly prepared for louvers. Could no one see this coming back in the sixties? We'll find a way to make it work and look cool. I hope. Is boost pressure the only thing we're thinking of? Nope. Since we're painfully aware of the fact that pressure drop before the compressors and an even distribution of air before the compressors are a key factors, we do not neglect this part in our turbo installation. Some shields here and there and we'll hopefully feed the turbo's with good fresh air. If it's possible to close the hood? We'll soon find out. If we can fill up oil without dismantling the boosting system? Yes, the SSR service department has been involved in the process from the start. Does it look Cool or Hollow-eyed? You be the Judge. You have maybe heard the saying Happy Wife Happy Life ? In search of undisputed truth we (I) in the SSR Team are doing some groundbreaking scientific experiment. My Wife has a Camaro 68 std cab, she has owned it for more than 15 years used it a lot and had a lot of fun with it. Originally it was a descent driver with ok rust repairs and not so much leakage from the transmission ok engine etc. But 15 years has taken out its right more rust leakage and some rather odd and strange behavior and for sure not a trusted and reliable friend any more. It was time for some overhauling and since we do not live in LA and tried to get in to the Chip Foose lottery we had to do it "ourselves", meaning it will not be ready in 7 days etc. OK what to do lets update powertrain to a take out from a Corvette 94 (350 LT1 with 4L60E transmission) CPP pro touring package, fresh body, paint, electrical, interior ………OK almost everything. 50 shades of, well not grey…. it has had many colors over the year Butternut Yellow, Purple, Green, Red and most of all a lot…. 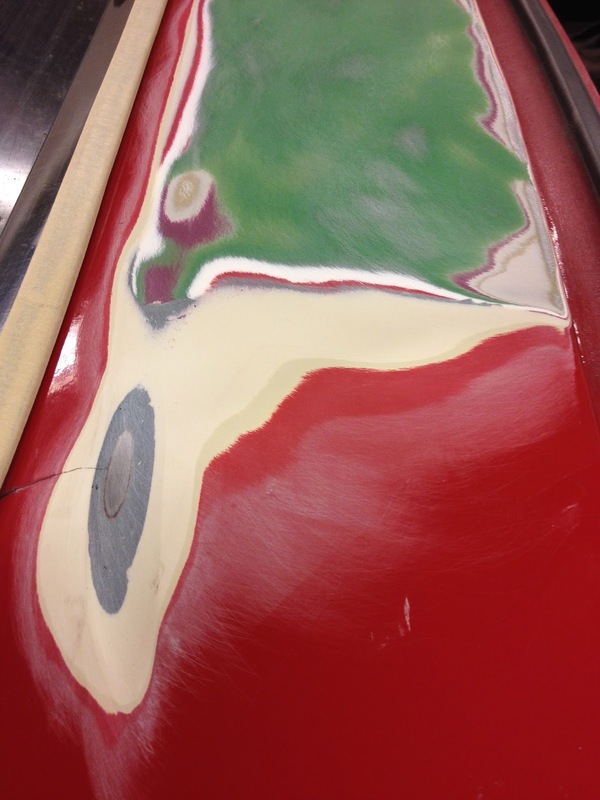 I mean a lot of body filler….. Under the filer you usually find rust and rather pragmatic rust repairs. Yes we found all of it. Further up along the road chassis and brakes in place, Pwrtr lurking at home in the Garage meanwhile my friend and wizzard is doing wonders no names but he is the best. It was so bad that we had to buy new trunk lid, doors and front to make it possible. To secure the undisputed truth we (I) have started to collect data and try find and tie it to reference literature and most of all searched for a correlation between Happy Wife and increased spendings in to automotive area. I will try to take a picture of here when she opens the American Express bill. Open Speed Shop, Volvo VROOM and warm weather! Swedes are prone to talk and continuously complain about the weather. There are reasons for that. I won't tell you more since it could effect our tourist industry. But even I have to admit that we for more than a week ( yes we're counting the days)﻿ have had Californian weather and hence we're all relaxed and summer cool. Today, we visited Volvo VROOM, a big Volvo meet and Volvo Swap market and we found some decoration stuff for our race car that, keep the looks together...the red rear lights from early Amazon's. Imagine a tailgate and diffuser in addition. Wouldn't it be nice? What's this? Well, even though the shining sun is relaxing, some of us (i.e. Anders) still work hard. Here's a newly made Y-connection, which will connect the two intercoolers to the throttle. Same part, but now from the air molecules view point of view. A crossroad. Billet made intercooling connection﻿ waiting for a TIG weld to show up. But how a bout the Volvo meet? Any cool pics? Well I liked this Volvo 1947. Where are we now? At the French Riviera? In Monterey, CA? Nope. In Gothenburg harbour. But what is this? Well, we need a really practical car for a while so we went to one of our Barns to pick up our old 454 Suburban. A vehicle that runs smoothly and is big enough host sofa or 22 wheels. If it's thirsty? Next question. Cardboard and Paper transformed to Aluminum. Step-by Step. Salt Slush Racing is in to manufacturing. We're basically making everything our self according a now well established packaging and design process. 1. Discuss until there is no more coffee or somebody change subject or until everybody gets quiet (has never happened). 2. Move stuff around randomly in an area where there's a chance to locate the part. 3. Make the part in Paper, Cardboard or Styrofoam. 4. Go through point 1 to 3 again. 5. Leave the iterative loop and move closer to fabrication equipment. The engine compartment packaging is coming together. The air filters (separated) can be seen in the right front corner (passenger side), the turbo installation, including bracket is now in place. Inlet manifold and throttle position is ok. Next step, which is happening right now, is to give the Intercooler inlet tanks a round shape and make two pipes to the compressor outlet's and to create a Y-connection from the Intercooler outlet tanks to the Throttle body. 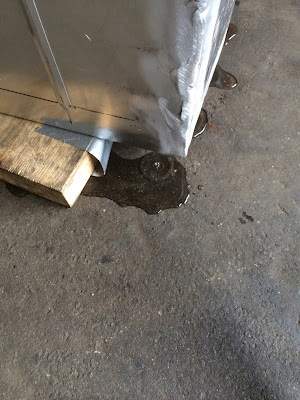 I have been welding and welding on what is to be our water tank fort, the "extra" water to water cooler set up in series with the air to water cooler. As written about earlier I'm a beginner in TIG aluminum welding. So voila what do you get ? Leakage ? Yes probably, and for sure some ugly welds….! That the welds are ugly we know, but how about leakage ? Let´s test ! Water is flowing in to the tank ! 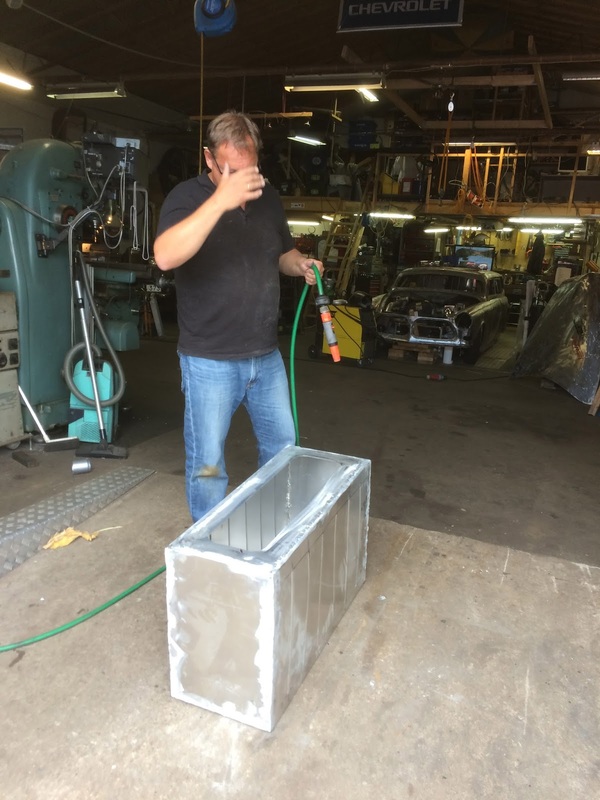 The final verdict: Back to the welding machine, even if Magnus started to talk about tank sealer….. I'm not so troubled since I'm learning and it could have been much worse, we didn't see any rats leave the garage. Besides of beginners welding skill, one mistake was that the welds were set up edge to edge. Should have been done with overlap, then it would have been easier, according to expertise. For sure next tank will be better. But first we need to finalize this one. We're finally there. We're at the point...or rather we've passed the point. The point when we started to concentrate on the engine. The heart, the sole and the source of Power. To recap, we're using an all aluminum Volvo 6 cylinder, which we'll create by mixing a Volvo 960 longitudinal (or if you like, north-south) installed 3.0L 6 cylinder from the early 90-ties with a transversal S80 T6 from 2005-ish.The later is called N3T in Volvo language. We'll use the block with piston cooling from the N3T and the oil sump & engine mounts from the older 960 engine. We'll actually use most parts from the N3T engine. Then we set the specifications. No oily hands so far. Next step was to remove everything from the block. Somewhat dirty. But as usually, pleasant. But how to clean the block? First we all agreed that glass blasting engine blocks is NOT a good idea. Never. Then I started with various types of manual cleaning devices and chemicals. After a while we reconsidered our strong opinions against glass blasting again. -It's after all High Pressure Die Cast block with no hidden oil channels...we argued. -Shouldn't be a problem... so I sealed all open areas off and in to the blasting cabinet it went. The result? Well, it turned out to be rather difficult to clean the block 100% even with the glass blasting strategy and on top of this, we needed to really clean the block afterward to get the evil sand (sorry, glass) out. Which is why we went to Magnus-at-home-workshop where the engine block was baptized as he lowered it into his giant hot fluid kind of machine. A moment of peacefulness. In the picture above you can see the block after the sacred process was completed. Our cylinder head arrived from Christer J. It was a quite moment, a moment of joy. The ports now have the size and the shape to cope with the airflow that we need to get the power efficiently. Inlet port close-up. Isn't nice? Meanwhile outside the SSR workshop. Carina enjoys the result from her experiment with garage hollyhocks. Yes, she's proud. Anders just could not stop weldning...maybe be got The TIG fever? Nevertheless, the throttle position is now fixed, the inlet manifold is ready and yes, there's space to the steering pin. If the air distribution will be perfect? We'll see...but since we have used the Guesstimate method and Cardboard Aided Design it should be ok.
We are all beginners at some point giving us the luxury to learn and develop. For a long time we have been staring at the next step on our learning curve…. TIG welding aluminum, a must to take our dream closer to reality. We could of course have called in the expert, payed and have had some really nice welds on our parts. We choose to do it differently, saving the money while spending the time getting fragments of competence and some ugly welds…. Ok, with some massaging and redoing it worked out. We would for sure not be able to earn our living on AL welding, and before the pictures, a word of warning, you shall use proper clothing and safety protection !!!! meaning not T-shirt, shorts and flip flops… I learned it the hard way all tough you get a nice tan. There's a first time for everything....but practices makes perfect… well maybe welds that we dare to test with water since it's the cooling tank and not the fuel tank. We are dealing with the elements that makes horsepower, beside water and air. Anders had an idea using the N3T air inlet in combination with some nice Al bends/tubes and a huge throttle for the air and started to set up the perquisites . Anders, Carina, Radar ( yeah, he got his nickname from M.A.S.H) and the SAJO milling machine, The SAJO 54 milling machine. Inlet manifold cut (milled) open to enable 3 times higher flow, and a somewhat bigger throttle. Bigger is sometimes better...90mm is very close to god,...sorry close to good. Now it was time for Anders to approach AL TIG welding with proper safety equipment !!!! Its getting there with some grinding and tweaking it will be good and we will of course test it for leakage. -Hell no! even if we like our heritage this is a inlet manifold with potential almost at the same level as Thors hammer. Anders and his creation. And yes, you got it, he's somewhat proud.